Yesterday marked Saudi Arabia’s National Day. To be sure, much has happened since the last one in 2011. In that light, it may be worth revisiting some of the lesser known — or unknown and/or un-remembered — sinews between the Saudi Arabian and American governments as well as our respective peoples. The following essay by National Council on U.S.-Arab Relations Founding President and CEO Dr. John Duke Anthony re-emphasizes not only much of what all too many are unaware of and tend to take for granted. It notes that many of those who acknowledge the strategic advantages and economic gains that have long accrued to both peoples would give a lot to exchange places if only they could obtain the same range of rewards. At the end of the essay are links to other essays that Dr. Anthony has written on Saudi Arabia and the Saudi Arabian-U.S. relationship. At its core, the relationship is solid. Three of its key components — cooperation in the areas of energy, economic development, and defense — are strong and healthy. In each of these areas, reciprocity of respect for each other’s needs, concerns, and interests remains a hallmark. In each, too, the quest for mutuality of benefit stands out. This is not only normal and natural. It is as it should be. In each, also, the range and diversity of the excess longstanding interdependence between our two countries is the envy of the leaders of practically every other nation in the world. In the Gulf region, the two countries, along with other friendly states, remain partners. Each share concerns about Iran and the extent to which it is frequently seen to be meddling in affairs that, in the eyes of many, are quintessentially Arab-related issues. Each, too, is anxious not to see the kind of transformation of power and position they believe would ensue were Iran’s nuclear development program to threaten regional stability, security, and the future prospects for peace and prosperity. And each remains insistent that Tehran submit the dispute involving Iran and three islands claimed by the UAE to international arbitration or other means of peaceful settlement. Each also continues to work for a more liberalized system of trade, investment, and technology cooperation. Both want to bring their respective private sectors closer together. Each wants to increase the number of joint commercial ventures between them. Both acknowledge the potential for such ventures enhancing regional economic growth and strengthening the civilian side of overall Gulf stability and security. At the same time, both, although in different ways, seek to revive the stalled Middle East peace process. Neither endorses the continuing colonization by Israel of Palestinian and Syrian land. Neither acknowledges the legitimacy of Israel’s ongoing refusal to accommodate relevant international law; its violation of the conflict resolution objectives of a record number of UN Security Council Resolutions drafted to end this regionally oldest, largest, and single most important and obvious reason for the deepening anti-Americanism in the region; its continued armed encroachment upon a forcibly occupied people’s right to freedom and dignity; and its consistent prevention of the Palestinians’ right to choose their own future. Neither has bought into Israel’s effort to convince the world that sovereignty over Al-Quds (Jerusalem) should belong to — and not be shared with anyone else by — Israel and Israel alone. Each is mindful of Israel’s repeated violation of the Fourth Geneva Convention. Each is more than concerned by the extent to which Israel, like the United States an early signatory of the Convention, continues to violate the rights of the occupied Palestinian people. Each underscores, albeit in different ways, the pertinence of the Convention’s prohibitions upon an occupying power, such as Israel, with regard to exploiting the occupied people’s resources; with regard to the expropriation of the occupied people’s land; with regard to expelling the occupied peoples from their homeland; and with regard to moving into the occupied territories colonists from the occupying power. Both are painfully aware of the implications of next month’s American Presidential and Congressional election being laced with the usual — and in some cases unprecedented — amounts of ill-becoming emotional excesses, factual distortion, unabashed pandering to special interest groups, the expenditure of millions of dollars in un-sourced political contributions, and cheap grandstanding about respect for the rule of law and pledges to uphold the Constitution. With the annual United Nations General Assembly proceedings presently underway, neither can either, or their counterparts among the 191 other UN Members gathered in New York, deny the unsettling effect upon America’s much touted championing of democratic ideals, processes, and outcomes stemming from the United States’ decades-old regional behavior — in the case of Palestine and Syria, and more recently in the case of Afghanistan and Iraq — that has encouraged, sustained, and in many cases increased extremism. Nor, America’s claims to be a democracy notwithstanding, can they deny the implications of the United States being the sole member of the United Nations, the world’s highest political body, to have cast an Olympic-record size dozens of vetoes on behalf of Israel and its American domestic supporters to thwart the democratic process and results of the United Nations Security Council’s repeated efforts to resolve outstanding issues pertaining to the Israeli-Occupied Palestinian and Syrian peoples. Each, too, is mindful of how unsuccessful they have been in their sometimes joint, sometimes separate, efforts to bring this longest of all unresolved regional conflicts to a peaceful settlement. The remarks of newly elected Egyptian President Mohamed Morsi published recently in the New York Times were telling in this regard. He emphasized the continuing dangerous implications for the vitiation of American trust, respect, image, and prestige stemming from Washington officialdom’s failure to live up to its stated obligations in the Camp David Accords regarding the need for Palestinian self-rule. In this, the Egyptian President was not and is not alone. Little wonder why. For in the eyes of many on both sides, the ongoing and inordinately one-sided American de facto support for the territorially expansionist objectives of six million people at the eastern end of the Mediterranean — at the expense of alienating and antagonizing America’s national security and related interests, and the continued placement of Americans and others in harm’s way as a direct result — has been and continues to be hardly cost-free. To think that this could continue indefinitely without additional eventual further blowback to the United States, the American people, and their friends and strategic partners than has already occurred — placing at further risk America’s legitimate interests among the Arab world’s hundreds of millions of Christians and Muslims and the larger world’s 1.6 billion Muslims — is simply not tenable. In this mutually acknowledged failure lies Saudi Arabia and America’s greatest challenge for the present and future. Each is fully aware that their larger goals of regional peace and prosperity will have little if any chance of success in the absence of a settlement. Each also knows full well that a settlement’s absence will continue to darken the landscape until and unless more effective means are applied to bring the conflict to a close. On their ability or inability to solve this problem to the satisfaction of the greater number of participants involved will continue to turn the long-term prospects of a healthier, stronger, and more mutually beneficial American-Saudi Arabian relationship. DR. JOHN DUKE ANTHONY is Founding President and Chief Executive Officer of the National Council on U.S.-Arab Relations, an American non-profit, nongovernmental, educational organization established in 1983 in Washington, D.C. In 2000, on the occasion of his first official visit to the United States, Moroccan King Muhammad VI knighted Dr. Anthony, bestowing upon him the Order of Quissam Alouite, Morocco’s highest award for excellence. Since the establishment of the six-state Gulf Cooperation Council (Bahrain, Kuwait, Oman, Qatar, Saudi Arabia, and the United Arab Emirates) in 1981 until the present, Dr. Anthony has been the only American invited to attend each of the GCC’s annual Ministerial and Heads of State Summits. 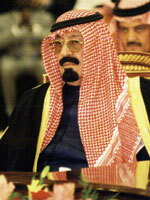 This entry was posted in John Duke Anthony, Saudi Arabia, US-Arab Relations.